The names Tabar and Dean are associated with high-quality mammography worldwide. In this fourth edition of the bestselling Teaching Atlas of Mammography, readers are again invited to share in the authors' experience of analyzing and evaluating mammograms. Their systematic approach not only instills a full understanding of the principles of mammography but also provides the requisite knowledge and tools to arrive at a highly accurate differential diagnosis. Rather than starting with the diagnosis and demonstrating typical findings, the approach of this atlas is to teach the reader how to analyze the image and reach the correct diagnosis through proper evaluation of the mammographic signs. Prerequisites for the perception and evaluation of the mammographic findings are optimum technique, knowledge of anatomy, and understanding of the pathological processes leading to the mammographic appearances. Teaching Atlas of Mammographyand the Breast Cancer book series by the same authors are essential for residents in radiology and practicing radiologists who need the highest level of training in the radiologic anatomy of the normal breast and the changes associated with benign and malignant lesions. They will help ensure that all clinicians acquire the optimal technique and knowledge of pathologic processes necessary to reach a correct diagnosis, and achieve the best long-term outcomes for their patients. Illustrations note w. 670 ill. The names Tabar and Dean are associated with high-quality mammography worldwide. In this fourth edition of the bestselling "Teaching Atlas of Mammography," readers are again invited to share in the authors experience of analyzing and evaluating mammograms. Their systematic approach not only instills a full understanding of the principles of mammography but also provides the requisite knowledge and tools to arrive at a highly accurate differential diagnosis. 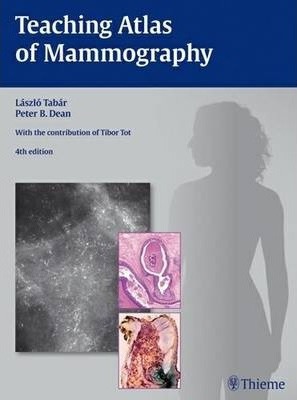 "Teaching Atlas of Mammography" and the Breast Cancer book series by the same authors are essential for residents in radiology and practicing radiologists who need the highest level of training in the radiologic anatomy of the normal breast and the changes associated with benign and malignant lesions. They will help ensure that all clinicians acquire the optimal technique and knowledge of pathologic processes necessary to reach a correct diagnosis, and achieve the best long-term outcomes for their patients.